More good news now as Alan Leigh at International Yacht Collection sells the 29.87m motor yacht Lady Laura with the buyer introduced by Randall Peston at Nio Group. Built by Westport-Westship in 1992, Lady Laura accommodates six guests in a master suite, double stateroom and a twin cabin. 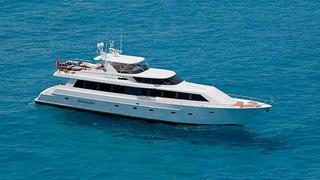 She is powered by twin 1080hp Detroit Diesel engines giving her a cruising speed of 16 knots and top speed of 19 knots. Lady Laura was asking $1,850,000.